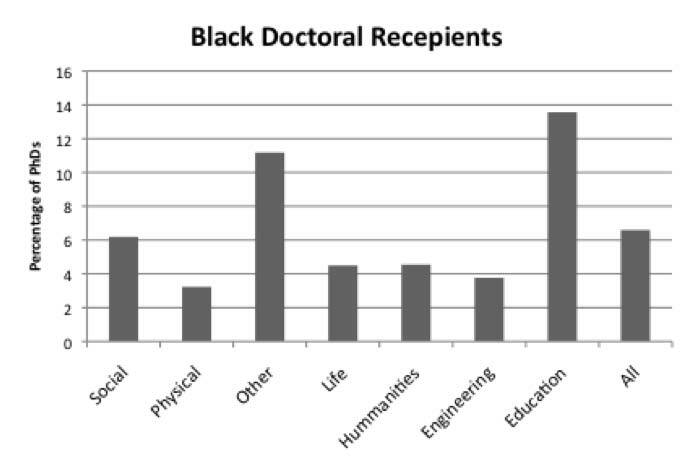 It can be difficult to get a read on the relative number of blacks in science or academia. There are some numbers out there regarding the bigger categories. The number of black PhD graduates each year. Number of black professors. Once you look for more detailed information it starts getting tricky. The numbers for graduates in my field are readily available via the most recent yearly NSF doctoral survey. The overall percentage is currently hovering around 6% ( Figure 1. Percent is of American PhD’s, not including internationals). That’s about half the expected number if you go by US census demographic data. My field overall is at a similar percentage, though for my two sub-fields the numbers are 1.9% and 3%. My field is so huge and wide ranging, especially including the application side of things, I have to wonder how many of those people are even trying to continue on as researchers. Some useful and more detailed data just became available via the NRC survey, which I will get into later. Either way with percentages that low, if you look at the raw numbers for that year things get so small at the sub-field level (single digits easy) that it almost seems as though I can point myself out. That’s a very odd feeling. Figure 1. For comparison purposes the latest census numbers Black/African-Americans are 12.9% of the US population. I used to not check Asian and Female in the applicant or employee information forms. In fact, I’d ignore the EEO form altogether. Now I make sure to fill that form out first and put a check next to those items so hard the paper almost rips. Nothing earth-shattering happened between then and now, so I am left wondering if I subconsciously notice that there is an unspoken preference for white males in my profession or if reality latently entered my brain? I just don’t know why.